KNEE-HIGH/OVER-THE-KNEE SOCKS WITH VARIETY OF COLORS TO MATCH YOUR BOOTS AND OUTFITS: Wine,Light Gray,Gray,Black,Beige,Coffee,Black and White knee high/thigh high cotton socks for both women and big girls. Great over the knee cotton socks for big girls 13 years and old as well with 19 Inch of calf size! They can be folded down as knee socks as well or add on grip to the thigh for women high boots! STAY ON WOMEN LADY’S KNEE HIGH COTTON SOCKS that are very soft and comfortable! Many buyers received compliments about these socks which match very well with lady’s favorite boots or shoes. They help to keep your legs warm and to show your unique personal taste of style and fashion! You will love them guaranted and you will come back for more colors!! 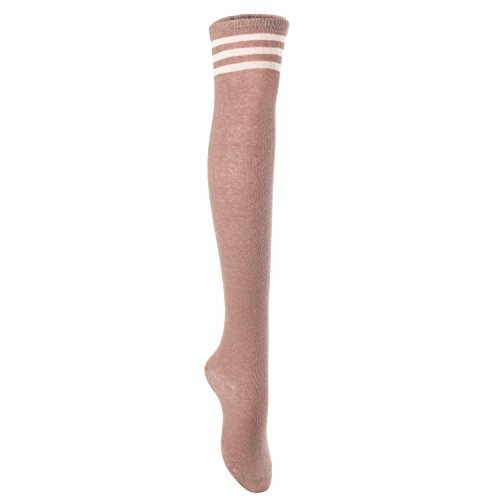 SPECIAL TECHNOLOGY TO PRODUCE THESE FANTASTIC WOMEN KNEE HIGH SOCKS OVER THE KNEE BOOT SOCKS: Mixed Spinning. These knee-high cotton socks fits most women with medium to slim built. Very long to come up over knees/boots. Fit great for wide calf as wide as 17.4″. Great neutral colors. Light weight.